Produktinformationen "Intimus 100 SP2 - 3,8mm Aktenvernichter"
The Intimus Pro 100 SP2 is a 3.8mm, 25 Sheet Strip Cut Shredder. 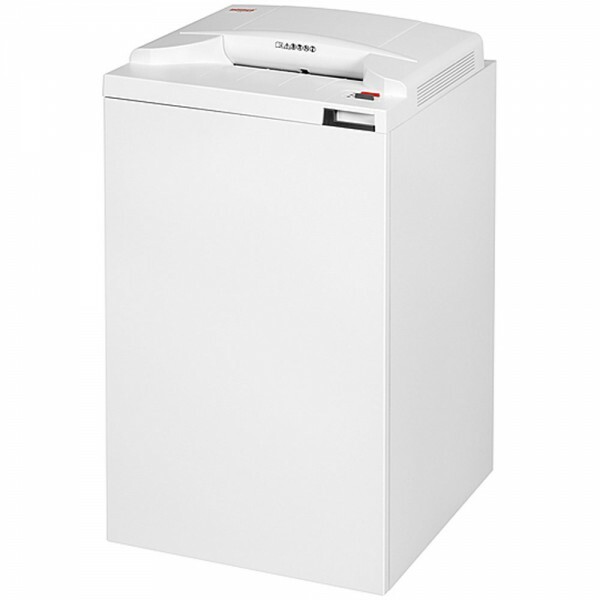 Supplied with a large 100 litre waste collection bin, the Intimus Pro 100 SP2 Office Shredder is a multi functional machine with a host of features that destroys paper, staples, paper clips, credit cards, floppy discs and CD/DVD's. Products are supplied with a user friendly removable waste basket for easy emptying of shreds within its compact design. The Intimus Pro 100 SP2 Shredder is made from shock resistant recyclable plastic and supplied with a manufacturer's 30 year limited cutter guarantee. Also supplied with DLS (Dynamic-Load-Sensor) which informs the user how much to shred by detecting the paper volume as it is fed into the cutting unit and illuminating a light strip in the throat area like traffic lights to eliminate paper jams. The Intimus Pro 100 SP2 multi functional Shredder has an Integrated Auto Reverse Function for easy removal of jammed paper and is very user friendly thanks to i-control® function control. 2x2 cut & collect: separate cutting blocks for digital media incl. Catch basket. The Intimus Pro 100 SP2 also includes Silentec®: innovative sound dampening principle and EcoLogic for more energy efficiency. Other features include a Dustproof enclosed cabinet which is mounted on rollers for flexible use. Made from shock resistant plastic and wood. Weiterführende Links zu "Intimus 100 SP2 - 3,8mm Aktenvernichter"
Kundenbewertungen für "Intimus 100 SP2 - 3,8mm Aktenvernichter"